Frogfishes are a family of fishes that look like misshapen toads - hence the name frogfishes. They are usually less than 20cm long, with some species less than 5cm in total length. They are sedentary ambush-feeders. Unsuspecting prey are attracted to a small beacon on the frogfish's snout only to discover they are falling into an enormous gaping mouth. Because their life-style is similar to the stonefish they look rather similar in appearance, although the beacon above the mouth is a giveaway. Frogfish do not have the defensive poisonous spines that make stonefish so feared. On Easter Monday Pupuke Robati Jnr was trolling about 3km west of Rarotonga when he snagged a large grotesque fish, 2-3 metres below the surface. Having never seen such a thing before he kept it and discussed it with Ian Bertram. They concluded that it was obviously a bottom living fish, and it was very strange that it was caught at the surface. Natural Heritage photographed the fish and emailed an image to Jack Randall at the Bishop Museum in Honolulu - a world authority on tropical fish. Jack identified it as Antennarius scriptissimus, noting that he had come across one in Tahiti a few years ago. Professor Ted Pietsch of Washington University (Seattle), the world authority on frogfish, confirmed the identification and provided additional information. This species, which has no English name, is one of the most rare and least known frogfishes. It is known from six specimens from Reunion (west Indian Ocean), Philippines, Japan (2), North Island (New Zealand), and Tahiti. The largest specimen was about 35cm total length, which makes Pupuke's fish at 50cm the world's largest. Pupuke's fish is not only the largest of its species, it is the largest of its family - it is the granddaddy of all frogfish! Unfortunately we are not in a position to give the species an English name but Pupuke's Greater Frogfish would seem about right - and thanks to his curiosity the specimen is available to science. The specimen will be preserved at the University of Washington. The addition of this new record to the Cook Islands Biodiversity Database brings the total number of marine fish (including sharks) to 633. Seven other new records have been added this year: Kevin Salisbury on Pukapuka added four, and Graham McDonald on Rarotonga and Manuae added three. 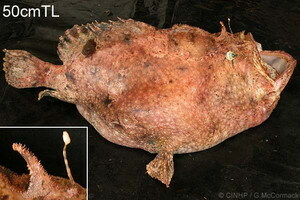 McCormack, Gerald (2005) The World's Largest Frogfish. Cook Islands Natural Heritage Trust, Rarotonga. Online at http://cookislands.bishopmuseum.org.